In May 2017, the Fit Filipino Movement (FitFil) spearheaded by celebrity fitness coaches Jim and Toni Saret (Biggest Loser Philippines Season 2”) sought to achieve their most challenging goal: to rally the entire Philippines to shift to an active lifestyle and collectively lose one million pounds. 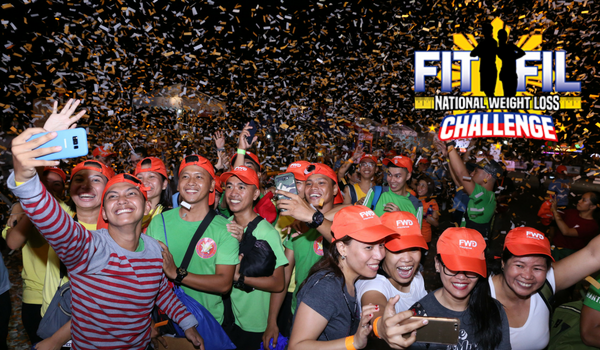 Now, six months later, the FitFil National Weight Loss Challenge has come to a close and the verdict is out: the Philippines has collectively shed nearly one million pounds in just half a year! The announcement was made during the movement’s culminating event, FWD’s Live to Move fitness party, held on December 3 at the Central Park, SM By the Bay, Mall of Asia. The centerpiece of the event was the "Campaign Achievement Celebration," which highlighted the campaign's collective achievements and recognized the more than a hundred organizations, institutions, LGU partners, and companies which took part in the project. Present during the occasion were representatives from these partner-organizations including the Philippine Medical Association, Philippine National Police, National Youth Commission, among others. Celebrity fitness coaches Jim and Toni proudly shared how the movement was able to achieve its objective of achieving its target in six months' time.